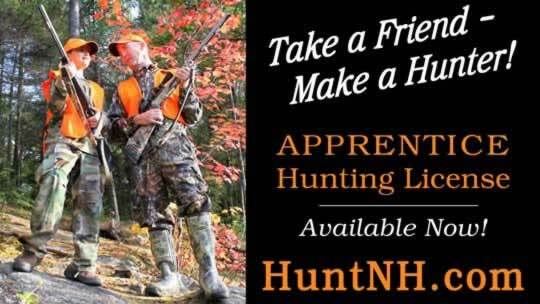 Hunting is a New Hampshire tradition, one that we strive to pass on to present and future generations. 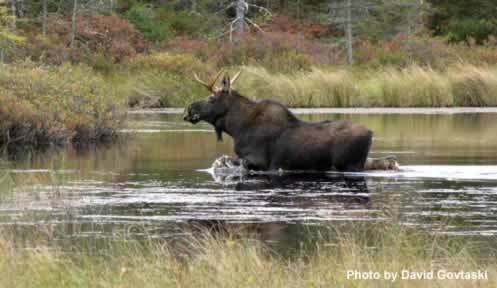 With greater than 70% of New Hampshire’s land under private ownership, the key to a quality hunting experience for most of us is the ability to access private lands. 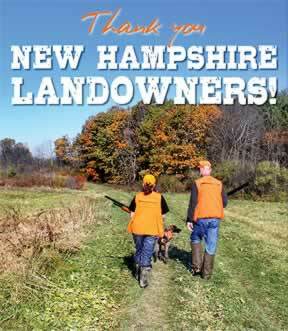 If we are to maintain the rich New Hampshire hunting tradition, it is important to remember that access to private land is a privilege provided to us through the generosity of the landowner. Access is one of the biggest challenges facing New Hampshire hunters and is one of the most significant threats to the future of our sport. Your actions represent all hunters. Always be the best ambassador of hunting that you can, through your actions and words. Plan to obtain permission whether the land that you would like to hunt is posted or not, as it is a courtesy and act of respect to the landowner. The owner can easily be identified through tax maps, which can be easily accessed at the local town hall or municipal office. If your request is denied, be understanding and remain polite, whether or not the landowner explains the reason for the decision. Often times you will find that the landowner does allow hunting, but is denying permission because they have already granted permission to a number of hunters. Other times the landowner may feel hunting will interfere with other land uses that are occurring on the property - such as building a house or a forestry operation. Ask the landowner where you should park and if there are any areas or times they would prefer that you not hunt on their property. Ask the landowner about setting up your game camera, tree stand, ground blind or other equipment that will be left on their property. As a courtesy to the landowner, include your name and contact information on any hunting related equipment you leave in the woods. Become familiar with boundaries of the land you have permission to hunt, as well as surrounding properties, recreation areas, farms and active logging operations. If you need to cross another person's property to access the land where you'll be hunting, ask permission first. Written landowner permission is required to operate any wheeled vehicle, including trucks and ATVs, on private property. If the landowner grants permission, understand clearly where you can and cannot drive. Written landowner permission is required for any tree stand, ladder or blind that damages or destroys a tree or that results in cutting of trees. Remember that you are the guest of the landowner. Treat their property with the same care and respect that you would if it were your own and respect any requests made to you by the landowner. Always carry out all trash, including that left by others. Be careful and conservative in using all vehicles and abide with restrictions of the landowner. Never block roadways, trails, crossings or gates, and always leave gates or other barriers the way you found them. Do not walk through crops without permission. Always cross fences in a manner that will not break or loosen wires or posts. If you are bow hunting, always retrieve your arrows. Use caution when hunting in fields, as a lost arrow can cause injury to the farmer and farm animals or damage to equipment. Notify farmers of any lost arrows. Do not field dress game near roads, hiking trails, or recreation areas. If in an area frequented by other outdoor users or close to a developed area, plan to remove all wastes. Remember that access to hunt is a privilege granted to you through the generosity of the landowner. Thank the landowner to express your appreciation for being allowed to hunt and let them know if you were successful. Consider providing a token of your appreciation, such as a portion of your game or a gift certificate to a local restaurant. For more ideas on how to thank the landowner check out our Thank the Landowner Page. For many of us, one of the most exciting and memorable hunting experiences will be that of mentoring a young hunter. As part of the mentoring process it is important that they understand that if we are to preserve our hunting heritage, we must respect landowners and their land. Consider providing them with an opportunity to ask a landowner for permission and to express their appreciation after the hunt. Hunting is a New Hampshire tradition, one that will only continue if we all follow the basic principle of landowner relations: Treat the landowner as you would like to be treated and treat their land as you would like yours to be treated. Each time you enter the field take a few moments to reflect upon the partnership between Fish and Game, hunters and most importantly private landowners which has provided you with this opportunity and consider what you can do to ensure that this opportunity will continue to be available for future generations.